The Artist to Artist Handbook is full of advice and tips for living an artful life. This gathering of information for all levels, beginner to advanced, is drawn from her years of creating and teaching art. Much of this knowledge is gained from Maud’s experience growing up in a household of artists, and from hours spent in the studio. 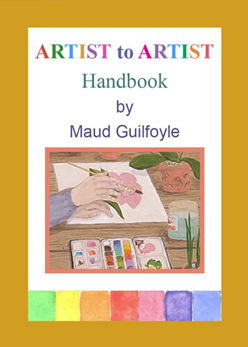 Written in a conversational tone,like that found in her art classes, Maud shares freely what she has learned, encouraging beginners as well as experienced artists to discover the joys and satisfactions of the daily practice of art. Teachers and parents will find the advice on making art with children helpful and thought provoking. Adult art students learning to draw and paint for the first time will find many practical gems to support their new-found interest. While this is not a step by step how-to book, there are numerous illustrated examples on such topics as keeping artist journals, making color charts,and composition in still life and landscape painting. There is valuable information here for all artists, including children, students, recreational artists, and teachers.